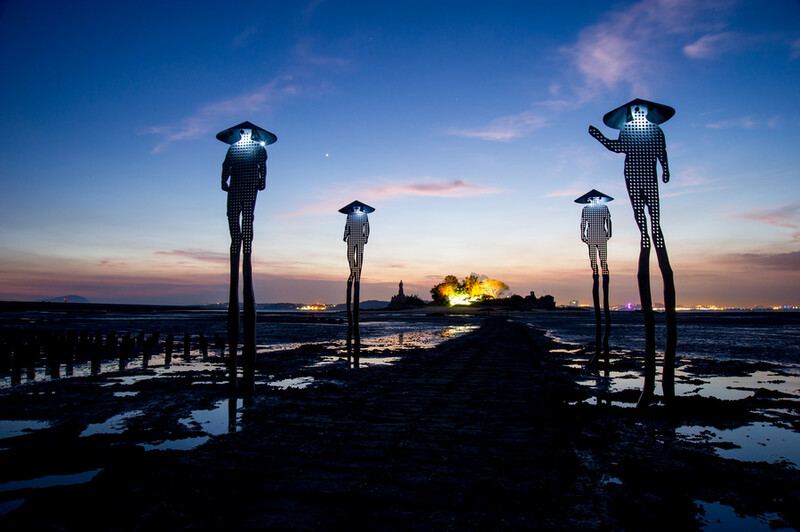 Oystermen is an environmental artwork at a tidal beach in Kinmen Island, Taiwan. The men are standing 6 meters high from the sand surface during low tide and are walking on water 3 meters high on top of waves as the ocean deepens on high tide. Gradually the legs will be covered by oysters. The Chinese hats of the Oystermen are working as solar energy collectors and illuminating the seascape at night. Commissioned by Floating Islands / Shanghai Biennial, curated by Sandy Lo.